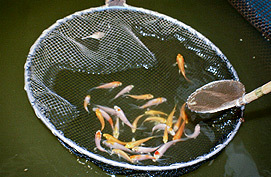 Every year, thousands of hours are spent spawning, culling and harvesting our koi and goldfish crops. These countless hours are spent with one goal in mind: To provide you with the healthiest, highest quality koi and goldfish possible. Co-owner Randy LeFever carefully injects hormones into a sedated Chagoi breeder. Spawning is where it all begins. Each spring, millions of koi and goldfish are hatched across our farms, with a variety of spawning methods in use. Some koi are wild-spawned. Mature male and female koi are selected and placed together in a mud pond. The pond is monitored to ensure optimal breeding conditions, and wiry spawning mats are placed along the banks of the pond. When the conditions are just right, the male and female complete their spawning ritual, with hundreds of thousands of eggs deposited onto the mats and fertilized. Some of the spawning mats are removed and transported to other ponds, while some will stay in the pond with the parent fish. Most of our koi are tank-spawned. Compatible breeders are selected and placed together into spawning tanks. Each tank is lined along the sides and bottom with spawning mats. Once paired, each breeder is sedated, and then injected with hormones to ensure ovulation. After recovering from sedation, the parent koi are left in the spawning tanks overnight. 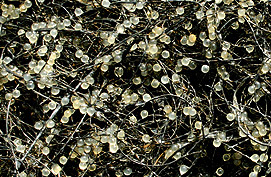 If everything goes to plan, we arrive the next morning to find spawning mats covered in eggs. The spawning mats are removed from the tanks and transported to mud ponds where the eggs will hatch. A successful spawn. Hundreds of fertilized koi eggs cling to the fibers of a spawning mat. A select few varieties of koi, and all of our goldfish, are hand-stripped. 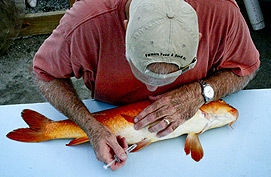 Similar to tank spawning, breeder koi are sedated and injected with hormones. However, instead of placing males and females together, they are kept separate, to prevent them from breeding. The brood stock is monitored closely for ovulation. When the time is right, the eggs and milt are stripped from the breeders by hand. The eggs and milt are mixed together in sterilized, stainless steel bowls. The fertilized eggs are then placed into hatching cones, where they will remain until they hatch, 4 to 5 days later. No matter what method is used, the koi fry all end up in mud ponds. They will grow rapidly, and will be monitored closely until they are ready for the next phase, culling. Fish that show potential, or “keepers”, are selected from the spawn and kept to grow out further. Only 2% or less of any spawn are keepers. It is a common misconception that high quality breeder koi produce thousands of offspring that look just like their parents. Breed two high quality Kohaku together, and you get thousands of equally high quality Kohaku, right? Not quite. Since the beautiful colors and patterns seen in koi are actually a genetic mutation, a very small percentage of koi offspring are attractive enough to have any market value. In some varieties, as much as 99% of the offspring are unattractive, with no commercial value. For this reason, our koi crops must be culled many times throughout the year. The first culling begins in mid-summer. 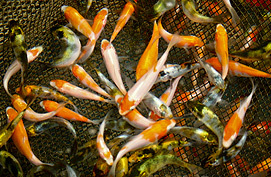 The fingerling koi, 1 to 2 inches in length, are removed from the mud ponds and brought into a hatchery facility. Here, groups of “pickers” will spend painstaking hours searching for koi that show signs of potential, and culling those that don’t. One inch keepers, ready for release into a grow-out pond. The “keepers” are put back out into mud ponds to continue growing. As they continue to grow, they are culled repeatedly. Some are removed; some are sent on to quarantine and then sold. The best of the best are selected for even further growth. These best of the best will eventually become our premium and premium select grade koi in the 10 to 16 inch range. 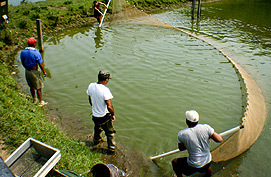 A long, flat net, called a “seine”, is used to crowd the fish into a corner. The thousands of hours spent spawning and culling eventually produces high quality koi and goldfish crops, ready for harvest. To harvest our crops, we use long, flat nets known as “seines”. A seine is lined with cork floats along the top, and lead sinkers along the bottom. After using sinking pellets to lure fish into a pond corner, the seine is quickly pulled across the corner, trapping the fish between the seine and the pond bank. The seine is slowly drawn into the bank, and the fish are removed from the seine with dip nets. After just a few “pulls”, the fish quickly learn what’s up, and will no longer come to the corner. At this point, the pond must be drained, and the remaining fish are removed.